Corn or Jola(in Kannada) is in season now. 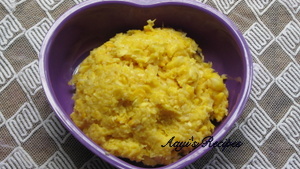 I saw this recipe in a magazine a while back Since we all love corn, I have tried it many times at home with my own little modifications and it comes out great. Since these balls are steamed, these are healthier options compared to the fried cutlets. Make a coarse paste of corn and then of all other ingredients. Make balls from the mixture and steam. Cook the corn(cooking in advance is not necessary if using most of the frozen corn which cooks very fast) and make a coarse paste of corn. 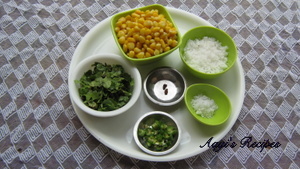 Make a coarse paste of coconut, green chillies, coriander leaves, asafoetida and salt. Add the paste to corn. Make small balls of the mixture, give it a slightly elongated shape. Line them in a cooker vessel or plate and steam them for 10mins. Add spices like garam masala or coriander-cumin powder for a slightly spicy version. Bind the balls well by pressing them to make sure they don't fall apart. 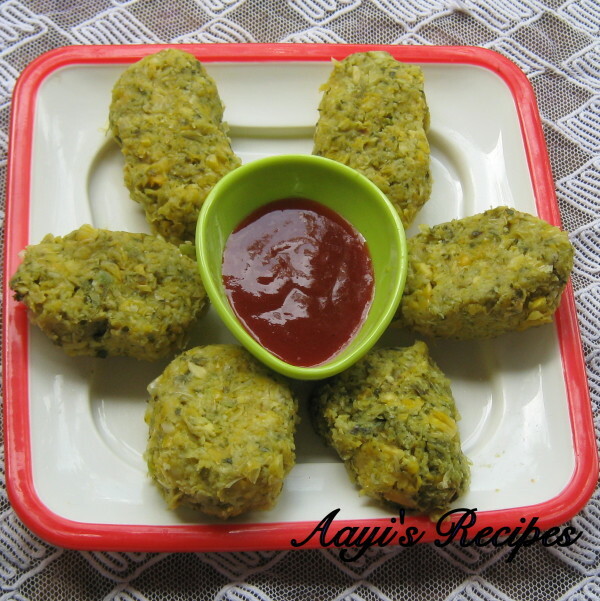 Just tried your new dish spicy steamed corn balls..it was just awesome. Loved it..
It’s a completely new recipe for me..
Small pack of corn was lying in my fridge was finding for new dish and on right time I got this.:-). Don’t we need something to bind things together? Like bread crumbs, or flour, maida, etc. To prevent it from falling apart?